Late in 2015 a conversation with Swatch management eventually got them convinced to invest into a 360° Video experience on the Freeride World Tour 2016 – for whom I’ve managed TV and Video production since 2009. The clip reached 400K views and ranked in Youtube’s France Top 3 for brand use of 360 video experiences (1/ Infiniti Europe 2/ Canal+ 3/ Swatch FWT 360 Insights 4/ Maserati 5/ Samsung Mobile – source: Youtube 360° Ads Leaderboard 2016). Pretty cool to be ranked amongst these big guys. How did it all start? During my years as a pro-kayaker I spent most of my time visiting some incredible and remote rivers around the world. Despite my best effort I often thought my videos couldn’t really convey the feeling of “being there”. Fast forward to the present day, and all of a sudden there’s this new cool technology called Virtual Reality and 360° video which takes us closer than ever to this dream of teleportation – in short, being able to see and hear what it’s like to be there (in VR litterature it’s called “presence“). My interest for Virtual Reality and 360 video goes back to the release of the Oculus Rift DK2 in 2014. After receiving the headset and getting over the initial Wow effect, I immersed myself in this new media, its new storytelling codes and seemingly endless possibilities. I read a lot about it (with articles ranging from video games developer to hollywood thinkers), subscribed to blogs, listened to the excellent “Voices of VR” podcast and tried many, many apps and videos to get my head around what worked – and what didn’t – in this wild wild territory. 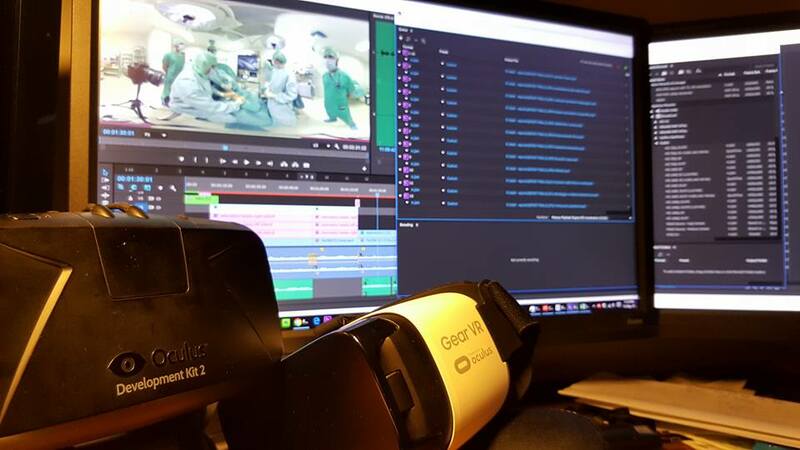 Interestingly my first professional project in 360 video didn’t involve remote locations and exotic adventures, but a place few of us will ever experience first-hand nonetheless, if not laying down unconscious on a table : the operation room. The late Estelle Balet is the central character of this clip. Retrospectively I’m very happy we had this opportunity to convey her special relationship to the mountain and to competing before her tragic passing last april. Her softspoken words really bring another dimension to the clip. The audio was recorded on an audiotecnica stereo microphone, plugged into a zoom recorder. Battery and card management can quickly become an issue in the mountain with subzero temperatures, which clearly favoured the use of the izugar rig. With just 2 cameras it’s much quicker to swap batteries and cards if needed. Also, given the fact that we would have plenty of shots to operate to leave our storytelling options open, and little time in post, we ended up shooting for the most part using the Izugar system. It drastically reduced the media management workload and also potential stitching issues in shots that we could not control 100%. All-terrain filmer Mathieu Coldebella went out to gather the shots, and after the competition I organised the stitching, graphics and voice-over with Estelle Balet that I wanted in the edit. In post we used Autopano Video pro for the stitching, After effects for the graphics and the Mettle plugins to insert them on the footage. The edit was done on Premiere Pro. Since it wasn’t possible to capture action upclose due to the nature of the mountain, I instead opted for a sequence using 2D footage spread around the viewer, to give a dizzying and overwhelming effect to the viewer and still bring some action into the clip. The online version shown above differs slightly from the initial version displayed in Chamonix. The Chamonix version had longer shots and a bit slower pace to really leave time to immerse into each scene through Gear VR headsets. The Youtube version being mostly seen on phones or computers it was shortened and the pace is a bit faster. Another clip is due to come out in the falls, featuring the four other tour stops after Vallnord (Chamonix, Fieberbrunn, Alaska and Verbier) and some really spectacular shots from these locations.